If you’ve seen rows of identical bikes in your city, you may be observing a bike-sharing system. Such programs are now implemented in dozens of cities in the U.S. and more than a thousand cities worldwide. Bike-sharing systems provide public bicycles at low or no cost to be used as needed by anyone who so desires. Users return the bikes or log the end of their use of them, so the bicycles are then available for the next rider. More people moving on bikes and fewer people driving in cars should help curb pollution, but are such programs actually effective in fighting climate change? One of the main reasons behind bike-sharing systems is reducing the usage of automobiles for environmental purposes. In addition, the systems can reduce traffic congestion and generally make urban areas easier to navigate. The first sharing system was in Amsterdam, created expressly to be a public good, both for the environment and for people without other transportation. Hundreds of bikes were simply dispersed around the city, recognizable because they were all painted white. Various sharing models soon developed and are now grouped according to sequential generations. The earliest form involved paying for short-term use of a bike and returning it to the spot where the user picked it up. The next generation is the deposit system, in which a key is released with the deposit of a coin and then the coin is returned when the bike is returned. This free system (since the deposit if returned) allows for return at various locations. The next generation, developed in the 1990’s, is the docking station-ID system. This system, which is one of the major ones used today, involves a user being identified. One might be a member of a program or may use a credit card to pay for the use of a bike, which comes from a docking station. This is a reaction to the high level of theft in earlier systems. In this system, the user returns the bike to any docking station, so the more stations there are, the better the program works. The fourth or current generation is dockless bike-sharing. This system has payments and usage similar to the dock programs, but allows for people to leave the bikes in reasonable places rather than pre-placed docking stations. They come with locks and can be found by GPS and unlocked with a digital passcode by the next user. These programs are enormously popular in China and rapidly growing in large metropolitan areas in the U.S.. There are pros and cons to the various bike sharing systems commonly used today. Docked systems, which are more likely to be operated by local governments, allow the easy identification of the bikes. Docked systems also provide an easy, inexpensive way to publicize the program. These programs don’t require a smartphone app or GPS and thus don’t favor tech-savvy people with more money. However, dockless programs, more likely to be run by private companies, increase the ease and freedom of bicycle usage. One of the major theories behind transportation-sharing is fixing the so-called “last mile” problem. This refers to the distance between where a bus or train may drop a person off and where they live. One could pick up a dockless bike to travel that last mile rather than walking. That is the advantage of not needing a docking station. For bike-sharing services to create the largest possible benefits, they must be used in great volume. To some extent, this is more likely to happen in an area in which the culture is conducive to riding bikes. For example, this would include places in which there is ample space for biking safely, with little fear of being hit by vehicles. China is in that circumstance, and with an enormous pollution problem as well. It has well-used ride-sharing programs of many varieties. In Shanghai, in 2016, bike sharing systems cut down carbon dioxide (CO2) by 25,240 tons. That is enough to help them make serious progress on their component of the Paris Accord, which requires nations to cut their greenhouse emissions. 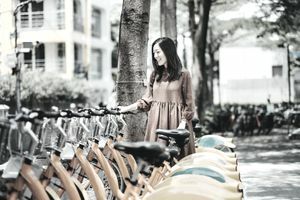 Because of the moderate use of bike-sharing services in the U.S. and other Western nations, we don’t have a large stock of data regarding their environmental benefits. At this time, we can only look to the nations with larger concentrations of bike-sharing and take lessons from them.